The Tuberculosis Control Program performs disease detection, surveillance, case management, and investigatory activities designed to control the incidence of tuberculosis (TB) in the County. The program provides tuberculosis information and educational resources for the Department, medical community, and general public. Please call (800) 722-4794 to speak to a TB staff member. Skin testing for tuberculosis is offered at Department of Public Health clinics throughout the County. For more information. Please call (800) 722-4777 for an appointment and information on clinic locations and times. A: Tuberculosis (TB) is a disease caused by germs that are spread from person to person through the air. Q: How is TB spread? A: TB germs are put into the air when a person with TB disease in the lungs or throat coughs, sneezes, speaks, or sings. These germs can stay in the air for several hours, depending on the environment. People who breathe in the air containing these TB germs can become infected. Q: What is a latent TB infection? A: People with latent TB infection have TB germs in their bodies, but they are not sick because the germs are not active. These people do not have symptoms of TB disease and they cannot spread the germs to others. However, they may develop TB disease in the future. Q: How do you know if you have latent TB? A: A TB skin test is used to test for latent TB. A: Both latent TB infection and TB disease can be treated with medication. Per Health and Safety Code Section 120175, local health departments as designated by the Health Officer are responsible for preventing the spread of tuberculosis within their jurisdictions. They are granted the authority to take the necessary measures to prevent the spread. When care is not provided by the department of public health TB Controller, the local health department tuberculosis program will oversee a case. View the Guidelines for Oversight of Tuberculosis Care. For information you can also visit the Current CDPH-CTCA Joint Guidelines website. The Tuberculosis Control Program offers case management services to all patients with active TB disease. A TB clinician and controller is also available to answer any questions regarding the medical management of your patient. Call 800-722-4794 to speak to a TB clinician and controller. The Tuberculosis Control Program also offers directly observed therapy (DOT) to patients who meet certain criteria. Please read the Guidelines for DOT for information on eligibility criteria. Health care providers must report suspected or confirmed cases of TB to the Tuberculosis Control Program. Please fill out a TB Health Facility Discharge Planning Guidelines for your hospitalized or clinic patient and fax to (909) 387-6377. Follow up with a phone call to one of our TB nurses at (800) 722-4794. Health care providers can submit a report of a TB infection, such as a positive skin tuberculin test or interferon-Gamma Release Assay (IGRA) (i.e. QuatiFERON Gold), using a Confidential Morbidity Report (CMR). 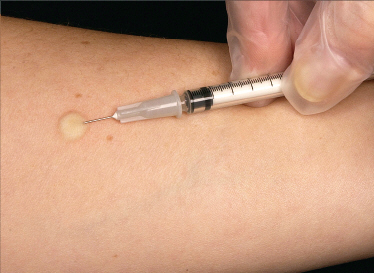 This form is only to be used to report a positive tuberculin skin test or IGRA. Any active or suspect cases must be made using the forms outlined in “Report a Case of Tuberculosis” section. These types of cases will not be accepted on a CMR form. The Centers for Disease Control and Prevention (CDC) revised the Tuberculosis (TB) Technical Instructions for Civil Surgeons. These instructions went into effect on October 1, 2018. These instructions now require that civil surgeons report all persons diagnosed with latent TB infection (LTBI) to the local health department where the applicant resides. These new requirements also include the use of a TB blood test [interferon-gamma release assay (IGRA)] instead of a tuberculin skin test (TST) for TB screening of applicants’ ≥ 2 years old. Civil surgeons are also required to refer all applicants whose CXR findings are suggestive of TB disease, all applicants with symptoms or signs of TB disease, all applicants with known HIV infection, and all applicants with extrapulmonary TB to the local health department for further evaluation. Measles is an acute, highly contagious viral disease. Symptoms include a high fever, runny nose (coryza), cough, loss of appetite, a rash, and red, watery eyes (conjunctivitis). The rash usually lasts 5–6 days, begins at the hairline, moves to the face and upper neck, and proceeds down the body. How Long Does It Take to Show Signs of Measles After Being Exposed? It takes an average of 7-14 days from exposure to the first symptom, which is usually fever. The measles rash appears approximately 14 days after exposure, usually 2–3 days after the fever begins. What Should Be Done If Someone Is Exposed to Measles? Notification of the exposure should be communicated to a doctor. 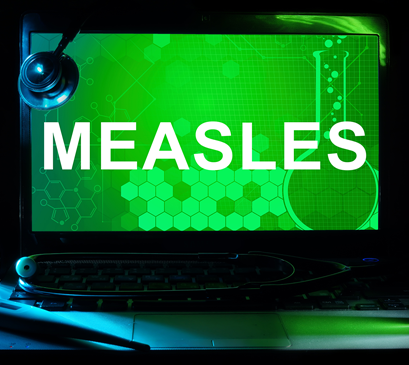 If the person exposed has not been vaccinated, measles vaccine may prevent disease if given within 72 hours of exposure. Immune globulin (a blood product containing antibodies to the measles virus) may prevent or lessen the severity of measles if given within six days of exposure. There is a vaccine available to prevent measles. Vaccines are available from your medical provider or the San Bernardino County Department of Public Health clinics. View the Public Health’s Clinic Locations webpage for information about clinic locations and times or call the Communicable Disease Section at 1 (800) 722-4794, Monday through Friday, from 8 a.m. to 5 p.m. to find a location near you. For more information, view the Centers of Disease Control Measles information webpage. Zika virus is a mosquito-borne virus that prior to 2015 occurred in Africa, Southeast Asia, and the Pacific Islands. However, in May 2015, the Pan American Health Organization (PAHO) issued an alert about the first confirmed Zika virus infections in Brazil. Since then Zika virus has been identified in several countries throughout South and Central America, and the Caribbean. There are currently no local detections of the Zika virus in San Bernardino County. For up-to-date information on where Zika is locally transmitted, please view the Centers for Disease Control and Prevention website. Most people infected with Zika virus will not develop symptoms. If symptoms do develop, they are usually mild and include fever, joint pain, rash and eye redness. If you have returned from an affected country and have any of these symptoms within two weeks, or any other symptoms following your return, please contact your medical provider and tell the doctor where you have traveled. While there is no specific treatment for the Zika virus disease, the best recommendations are supportive care, rest, fluids and fever relief. Zika virus is spread by the bite of an infected Aedes species mosquito, which actively bite humans during the daytime. These are the same mosquitoes that spread dengue, chikungunya, and yellow fever viruses. Mosquitoes become infected when they feed on a person already infected with the virus. 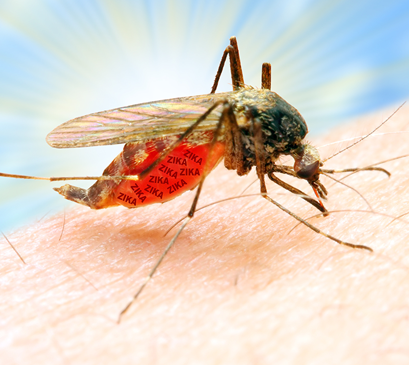 Infected mosquitoes can then spread the virus to other people through bites. Zika virus is rarely spread from person to person. There have been rare instances of sexual and perinatal (mother-to-child) transmission, as well as through blood transfusion. Although most people who become infected with Zika virus have no symptoms, approximately 20% may develop acute onset of fever with rash, joint pain, or conjunctivitis (red eyes). Symptoms begin between 2 and 12 days (most commonly 3-7 days) after exposure to the virus. Other commonly reported symptoms include muscle aches and headache that may last for several days to a week. Severe disease requiring hospitalization is uncommon and deaths from the disease are rare. However, there have been cases of Guillain-Barré syndrome reported in patients following suspected Zika virus infection. The Zika virus can cause birth defects in pregnant women. Researchers have amassed enough evidence to conclude that Zika infection during pregnancy is a cause of microcephaly (abnormal brain and small heads) and other severe fetal brain defects. Residents can still take precautions to avoid mosquito breeding areas around their homes by following these tips. Report – If you notice small black and white mosquitoes in or around your home contact the San Bernardino County Department of Public Health, DEHS MVCP at (800) 442-2283. Whooping cough, known medically as pertussis, is a very contagious disease caused by a bacteria. It can cause serious illness in babies, children and adults. Babies are most at risk, because they are too young to be fully vaccinated. The disease usually starts with cold-like symptoms and maybe a mild cough or fever. Symptoms of pertussis usually develop within 5 to 10 days after being exposed, but sometimes not for as long as 3 weeks. People with pertussis have severe coughing attacks that can last for months. As the disease progresses, the traditional symptoms of pertussis may appear and include many rapid coughs followed by a high-pitched “whoop”, throwing up during or after coughing fits and exhaustion following a coughing fit. In babies, the cough can be minimal or not even there. Babies may have a symptom known as “apnea.” Apnea is a pause in the child’s breathing pattern. Babies too young for vaccination are at greatest risk for life-threatening cases of pertussis. In babies younger than 1 year old who get pertussis, about half need care in the hospital. The younger the baby, the more likely treatment in the hospital will be needed. 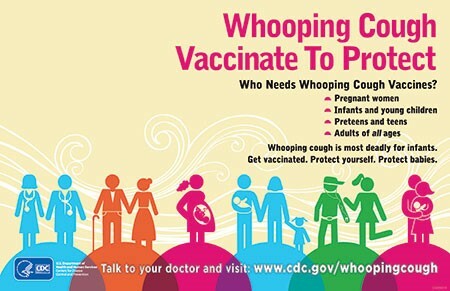 Whooping cough (pertussis) is most contagious before the coughing starts. People with pertussis can spread the disease by coughing or sneezing while in close contact with others, who then breathe in the pertussis bacteria. Many babies are infected by parents, older siblings, or other caregivers who might not even know they have the disease. Pertussis vaccine is available at County Public Health Clinics. To make an appointment call 1 (800) 722-4777. The best way to prevent pertussis (whooping cough) among babies, children, teens, and adults is to get vaccinated. Also, keep babies and other people at high risk for pertussis complications away from infected people. There are two vaccines used in the United States to help prevent whooping cough: DTaP and Tdap. These vaccines also provide protection against tetanus and diphtheria. Children younger than 7 years old get DTaP, while older children and adults get Tdap. Babies should begin their DTaP series by 2 months of age. The Centers for Disease Control and Prevention recommends pregnant women get a Tdap vaccine between the 27th and 36th week of each pregnancy, to create protective antibodies that pass to the baby before birth. These antibodies provide the baby some short-term protection against whooping cough in early life when the baby is too young to get vaccinated with DTaP. Mumps is a contagious disease caused by a virus. The virus that causes Mumps primarily affects the parotid glands — one of three pairs of saliva-producing (salivary) glands, situated below and in front of your ears. Mumps is easily spread by airborne droplets from the upper respiratory tract. Symptoms typically appear 16-18 days after infection, but this period can range from 12-25 days after infection. Some people who get mumps have very mild or no symptoms, and often they do not know they have the disease. Most people with mumps recover completely in a few weeks. How Do I Prevent Getting Mumps? 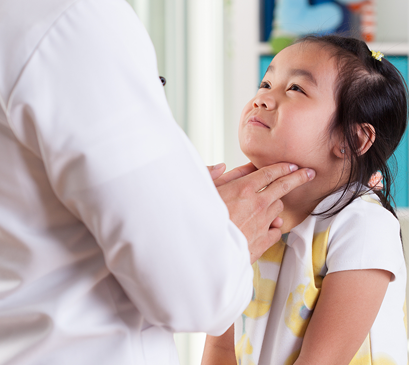 Mumps can be prevented with MMR vaccine. This protects against three diseases: measles, mumps, and rubella. CDC recommends children get two doses of MMR vaccine, starting with the first dose at 12 through 15 months of age, and the second dose at 4 through 6 years of age. Teens and adults, who do not have evidence of immunity, should also be up-to-date on their MMR vaccination.